The Barbour Publishing Company and Mansfield Cottage Natural Products are the Barbour County Chamber of Commerce Members of the Month for September. 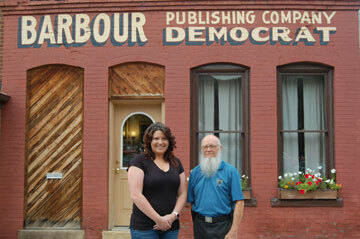 Ashley Cutright, left, is the Manager of the Barbour Publishing Company. Rev. Bob Wilkins, right, is a retired United Methodist Minister and local beekeeper registered with the West Virginia Department of Agriculture. The Barbour Publishing Company is a subsidiary of the Barbour Democrat, LLC., which has been in publication since 1879 and under its current ownership since 2008. The Barbour Democrat, LLC. prints a weekly newspaper and specializes in small-scale printing, including binding, copy-editing, design and printing of books, brochures, menus, flyers, posters, and signs. The company also offers multiple promotional items and election materials such as signs pens, cups, T-Shirts, and more. Rev. Bob Wilkins markets his honey as natural, or raw, since it is not heated or purified. “It is filtered through a mesh screen to remove some beehive debris,” he says, “and is packaged in 8 oz. jars specifically for those who use a small quantity at a time.” Rev. Wilkins offers a seasonal item, a lip balm, which he also prepares in the fall and winter in a handy pocket tube. Mansfield Cottage Natural Products are available at the Market Place in downtown Philippi. Rev. Wilkins currently serves as the Chaplain for the Philippi Volunteer Fire Department and is the Municipal Judge for the City of Philippi. Before entering the Christian Ministry, he was a member of the NASA Apollo Program which landed astronauts on the moon. He was also a member of the Office of Naval Research in Alaska engaged in glacial research. He is a graduate of colleges in New York, Ohio, and West Virginia, and received his doctorate from United Theological Seminary.